Save sqlstyledtable.php as sqllinks.php AND as sqllinks2.php so you have two new copies. You know what a link looks like in HTML. You also know that you can add data onto the end of the link which PHP can then use through $_GET. If you do not remember that it is worth re-reading it now (and look at getsend.php and getget.php) as what comes next is easy but only if you know the basics already. The instructions below add links to the CD titles so that whichever one you click on you see a page with that CD's tracks. You have everything you need to do that so feel free to do it yourself OR follow the instructions below. In the PHP change the heading, text, table headings, variable names and the index names until the page works (you will need to delete some). Also delete the if which uses style to change the text colour where prices are below 5 and delete the variable $highlightclass a couple of lines lower. Try it and you should see the tracks for the CD with the reference 1. Save both pages. Load sqllinks.php and click on one of the links. 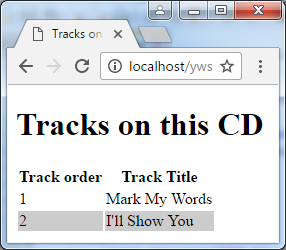 The second page should now show tracks for that CD and not always the first CD. 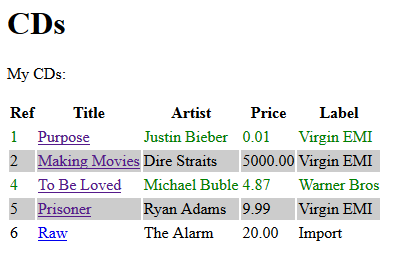 The links allow the user to choose a CD. That choice is passed to the second page in the URL. You extract that from the URL. You use that reference in the query. Each time a different link is clicked on different data is shown. Amazon and many others use this technique. This site uses it. It is worth following the data through your code. The data starts in the database and then is output to HTML by your PHP. Some of that is in the form of links. Clicking on a link asks for the next page but also sends the CD reference to the new page. That data is extracted into a variable and used to change the SQL query to get the correct data. This may be the most important thing you can learn about using PHP and SQL together.